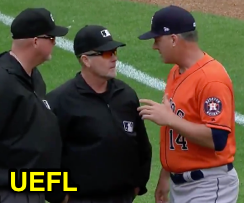 1B Umpire Jerry Meals ejected Astros 1B Marwin Gonzalez (Unsportsmanlike-NEC, kicked baseball thrown to mound by HP Umpire Gabe Morales; QOCY) in the top of the 8th inning of the Astros-Rangers game. With two out and none on in the bottom of the 7th inning, Rangers batter Ryan Rua struck out to end the inning. As is customary following the third out of an inning, a ball was tossed toward the pitcher's mound to await the next Rangers pitcher's arrival on the field. Replays indicate Gonzalez intentionally kicked this moundball as he jogged off the field and into the Astros dugout, the call was irrecusable. At the time of the ejection, the Astros were leading, 7-1. The Astros ultimately won the contest, 8-2. This is Jerry Meals (41)'s first ejection of the 2018 MLB regular season. Jerry Meals now has 2 points in the UEFL Standings (0 Prev + 2 MLB + 0 Irrecusable Call = 2). Crew Chief Jerry Meals now has 2 points in Crew Division (1 Previous + 1 Irrecusable Call = 2). This is the fifth ejection of the 2018 MLB season. This is the 2nd player ejection of 2018. Prior to ejection, Gonzalez was 0-4 (3 SO) in the contest. This is Houston's 1st ejection of 2018, 1st in the AL West (HOU 1; LAA, OAK, SEA, TEX 0). This is Marwin Gonzalez's first ejection since Sept 22, 2017 (Dan Iassogna; QOC = N [Balls/Strikes]). This is Jerry Meals' first ejection since June 24, 2017 (Nick Franklin; QOC = U [Replay Review]). #Astros 1B Marwin Gonzalez had some words for umpire Jerry Meals..